The old woman hovered backwards over the hairdresser’s chair and landed with an audible thump. “Not so graceful as I used to be,” she groaned, settling her wide bottom. “What shall we do for you today?” asked the twenty-something, less-than-a-hundred-pounds hairdresser. “Well, you can’t erase the lines on my face or bring back my youth, so you may as well trim the split ends, and I’ll be on my way” the old woman said with a sigh. The hairdresser pulled a fresh lavender cape from the shelf. As she shook it out and slipped it over her client’s head, she looked in the mirror, into the woman’s eyes. She smiled. “I think you have wonderful features,” she said. “You remind me of my grandmother, and she’s the most beautiful woman I know.” She pulled the pins out of the woman’s hair, watching it slip and fall onto and down her shoulders, gradually exposing lush silver and gold waves that shone like watered silk. “You must carry a lot of memories in this hair,” said the stylist as she ran her fingers through the glowing strands. “That I do, girl,” nodded the woman. “That I do.” She scowled into the mirror. “Memories are all I have left at my age. It’s no fun growing old. I don’t recommend it.” She tugged at the cape on her lap and tried to cover her knees. “Are you cold? Would you like me to get you a blanket?” offered the hairdresser. The young woman’s eyes met the older woman’s in the mirror. She hesitated, not knowing at first how to react, and then she laughed. “What a funny thing to say,” she chuckled. The old woman nearly smiled for the first time that morning. She looked around the beauty salon and began to relax. She noticed a pair of pantyhose hanging from a hook beside the hairdresser’s station. One leg was half stuffed with something, giving it the size and shape of a foot, ankle and calf. The other leg hung empty and limp. “What’s that for?” she asked. Only once had she been anywhere near Louisiana. It was a surprise trip to Florida that he planned for her birthday. They rented a canoe and paddled up a river on the Gulf side of the Florida coast. Warm springs fed the river with a temperature that attracted strange sea mammals from the cold winter gulf waters. 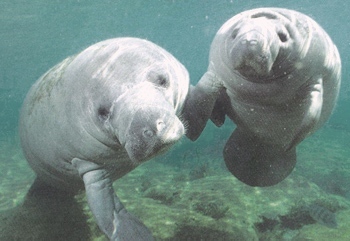 Here, for the first time, she saw a manatee. The hairdresser’s scissors began to snip inch-long clippings that landed on the floor. “Don’t take off too much; just the split ends.” After a few minutes of silence the old woman spoke. “They’re ugly creatures, you know,” she said. “What are?” asked the hair dresser. “Manatees.” The old woman stared in the mirror stuck in a defiant silence. Memories began to cloud the surface of the glass. A large, gentle creature with fan-shaped tail and arms that curved and moved with uncannily human gestures slowly appeared, a calf by her side. A small intake of breath escaped the old woman as she remembered the sunlight, how it sparkled on white sand beneath the turquoise water and reflected in her husband’s clear blue eyes. They sat together entranced, watching the two strange creatures. His face, which had long since disappeared beneath years of crusted grief and disappointment looked up and smiled at her through the mirror. He didn’t seem to notice her age; he only saw her youth and beauty as it was back then. The faded hair was still beautiful, luxurious, long, and now with ends neatly trimmed. But she couldn’t look. His face – it was so young, so alive. She pushed the mirror away, dropped her chin and bunched the lavender cape into her fists. “Take it off,” the old woman sputtered. “I can’t stand it.” Tears streamed down her cheeks as she tugged at the material on her lap. Are we as writers allowed to say, “So do I?” Because I do too! Thank you so much for your comments. I will visit your blog today and read more of your work. In the meantime my dog needs a poop. Bye! !